In the magical world, there are a lot of wizards, some are good some are bad. But none of them have the knowledge and power like the great Albus Dumbledore. Albus Dumbledore is one of the most popular wizards in both the wizard and the muggle world. He gained respect through his years at Hogwarts, and later when he became the Headmaster of Hogwarts. You will see him with his long white hair and his long white beard, wearing a long purple coat with a yellow hat. He first appeared in the Harry Potter movie franchise. He will rarely show his face in the Harry Potter: Hogwarts Mystery mobile game. You will first see him at the start of Year One, where he will welcome new students at the Sorting Ceremony. There he will gladly greet all the students and wish them good luck in their very first year at Hogwarts. Albus Percival Wulfric Brian Dumbledore was born in a small village in Great Britain to a wizard mother Kendra and a Muggle father Percival Dumbledore in 1881. He had a very rough and a tragic childhood. He had a younger sister Ariana and an older brother Aberfoth. He experienced a few tragedies while he was growing up that changed him and made him the respectful wizard he is. Few young boys were spying on his young sister while she was practicing her magic. They approached her excited and terrified at the same time, wanting to know what was going on. They demanded an explanation but they didn't like what they heard. Muggles can't do magic. In their rage of mistakenly understanding that she was mocking them, they attacked her and left her with a scar for life. After that, she was unable to control her magic powers and emotions which lead to even more havoc in her future life. Dumbledore's father was furious, he went after the kids, seeking justice and attacking them, but got caught in the process and ended up locked in Azkaban, where he died. Dumbledore's mother shared a similar fate but a far more severe one. She was unintentionally killed by her own daughter while she had the worst day of controlling her powers. The Dumbledore brothers, meaning Albus and Aberforth, were devastated. They came to an agreement that someone has to watch over her and keep her out of touch with the rest of the world. When you think things can't get any worse, Dumbledore brothers started arguing about the future of their sister with Grindelwald (Albus's friend). That argument converted into a 3-way duel. Devastated Ariana tried to stop them, which led to her powers backfiring again and she ended up dead. Albus's whole life was a tragedy but he endured it all, and all of those things led up to him becoming one of the best wizards there is. Chapter 2: Dumbledore is first seen at the Sorting Ceremony where he will welcome you and other new students. Chapter 9: your protagonist will approach Dumbledore and there they will speak about all the things that happened in Year One, and he will award you 100 house points which will lead to you winning the House Cup. Being the Headmaster of Hogwarts, Dumbledore will always be there at the beginning and the end of each school year to give all of the aspiring witches and wizards an encouraging speech and announce the winner of the House Cup. Aside from that, Dumbledore always seems to be busy with something, as we only see him in one of the chapters. It is highly unlikely that he is not aware of all of the things happening at Hogwarts, including the Cursed Vaults and Cursed Ice. Chapter Ten: Professor McGonagall comes to inform you that you were summoned by the headmaster himself. 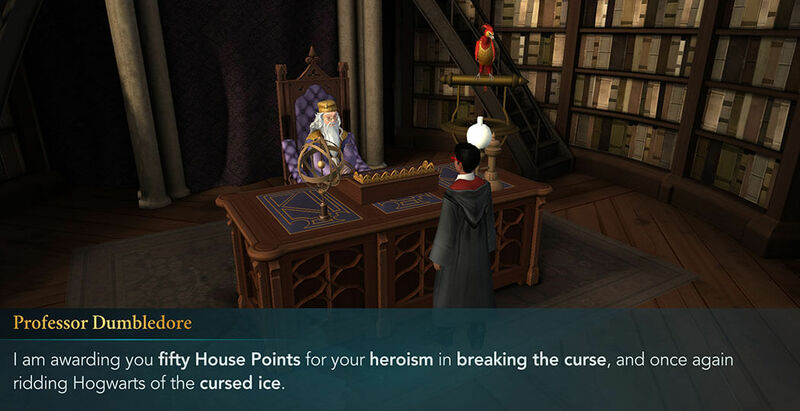 Dumbledore is delighted with the bravery you showed in tackling the Cursed Vault problem and riding the school of the Cursed Ice. He will award Gryffindor 50 House Points for this feat. You may have just helped your house win the cup this year with that.